A great night at CrossPoint Church with Victim Relief Ministry leaders, Glenn & Gail Cato, the Land's, & Martha Jordan. 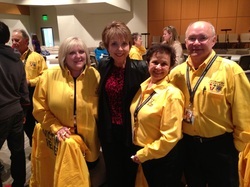 A great group of people practicing the "Golden Rule" in their cool, gold shirts. You can help the hurting. Victim Relief Ministries partners with churches, individuals, corporations, and others to provide HELP, HOPE, and COMFORT to victims of crime, disaster, and terrorism. If you want to get involved or want more information email me I will get the info to the VRM crew in Grand Prairie. 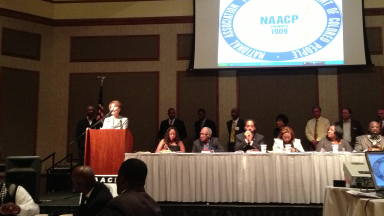 Jorja Clemson speaking at the 22nd annual NAACP Freedom Fund Banquet. Along with several of the candidates for city council and school board of trustees, I made a short speech at the 22nd annual Freedom Fund Banquet of the Grand Prairie NAACP Branch 6260. It was quite an event where people, organizations, and businesses were recognized. There were 69 awards in all. It was great to see many longtime friends and acquaintances, especially some of the teachers and administrators that have helped shape the lives of so many children in Grand Prairie. Forums, forums, and more forums. The Chamber of Commerce hosted a very well attended candidates forum. By teaming with the GPISD and using their boardroom we were able to setup tables with our campaign signs and literature. Dan went a little over the top by bringing in one of our 4'x'4' signs. We had a opportunity to make some introductory comments and then were treated to some tough questions. I guess this helps prepare the candidates for city council meetings. Herb Rolph was our Facilitator. They may want to consider Herb for the next Presidential Debates. Lynn McGinely, President of the Grand Prairie Chamber of Commerce, and her team did another excellent job. 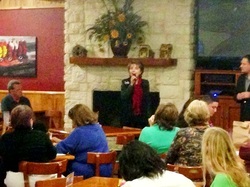 Our Chamber of Commerce does such a great job in representing the businesses of Grand Prairie. Our business leaders help drive our economic development. As you know the commercial, industrial, retail, and hospitality sectors of our city offer jobs and help lighten the tax burden for our citizens. I will work hard for quality economic development in Grand Prairie. 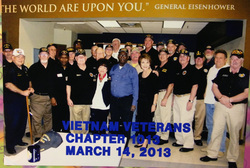 It was my pleasure to join with the Vietnam Veterans of Grand Prairie on the 14th as they honored Ruthe Jackson. As the story goes, the city was trying to decide what to do with the Senior Citizens Building after the seniors moved to The Summit, a more than state of the art senior facility. Ruthe suggested a new Veterans Center since the old one was torn down several years ago. It was a great idea and the city is to be commended for following through. It is a great facility. Needless to say the vets remember those that have their back. I want to thank Ray Bush and the guys for remembering my mom. This well attended forum is a credit to the host organizations. The more we are involved in our city the better it will be. The progress of Grand Prairie over the past few years is undeniable. With everyone working together we will make our city even better. Thank you to the members of the Grand Prairie NAACP, Grand Prairie LULAC, Grand Prairie Hispanic Chamber of Commerce, Grand Prairie Minority Leadership Coalition, and HACE for the warm welcome. I appreciate being asked to participate. It was great meeting everyone and visiting with long time friends. Also a special thank you to John Lopez. He did a great job as the Forum Coordinator. Not an easy job to stay on schedule with so many so willing to talk for sooo long. I will be #1 on the ballot. That is great! Every little bit helps. Below is the early voting info I got from the city. April 29 - May 3 (Monday through Friday) Dallas and Tarrant County 8 a.m. - 5 p.m.
May 4 (Saturday) Dallas County 8 a.m. - 5 p.m.
Tarrant County 7 a.m. - 7 p.m.
May 5 (Sunday) Dallas County 1 p.m. - 6 p.m.
Tarrant County 11 a.m. - 4 p.m.
May 6 - May 7 (Monday and Tuesday) Dallas and Tarrant County 7 a.m. - 7 p.m.
Dallas County voters may make application for mail ballots directly to the Dallas County Elections Administrator, 2377 N. Stemmons Freeway, Suite 820, Dallas, Texas 75207; Tarrant County voters may make application for mail ballots directly to the Tarrant County Elections Administrator, 2700 Premier Street, Fort Worth, Texas 76111. Applications for ballots by mail must be received no later than May 3, 2013. The last day to register to vote in the May 11, 2013 election is April 11, 2013. I spoke with the President of Beacon regarding recent activity on the "Cobra" well in our neighborhood. He said they have started "clean-up" of the well. There is still water in the line and it will probably take a few months before that clears out. They are actually selling gas from it now. The initial rates on it may be lower until they find out how good the well is, which should be in about 3 months. The checks to homeowners are projected to start in about 90 days. Hope this information is helpful. I will be contacting him again for further updates. I will be updating everyone on events I am involved in and election issues. Just getting started with my blog. More information to come. As a member of the City Council I will continue to work to make Grand Prairie a better place to live, work and play.